We are interested in cell autonomous innate immunity, i.e. in the ability of individual cells to defend themselves against infection. Targeting of anti-bacterial autophagy to a cytosol-invading bacterium through galectin‑8‑mediated glycan detection on a damaged endomembrane and recruitment of the cargo receptor NDP52. The mammalian cytosol is rich in nutrients but can be colonized by specialized bacteria only. We therefore wish to understand i) how cells succeed in defending their cytosol against most invasion attempts and ii) how professional cytosol dwelling bacteria outwit cellular defences. We are particularly interested in danger receptors that detect breaches in cellular integrity, and in the ubiquitin system that marks invading bacteria as cargo for autophagy receptors. The defence against pathogens requires profound changes in gene expression that are coordinated by latent transcription factors of the NF-kB and IRF families. We aim to understand how infection activates NF-κB and IRF signalling. The genetic analysis of somatic cell lines holds significant potential for our understanding of signal transduction and other cell autonomous traits. We use haploid cells, CRISPR technology, and chemical mutagenesis to isolate genes governing the interaction between pathogens and host cells. LUBAC-synthesized linear ubiquitin chains restrict cytosol-invading bacteria by activating autophagy and NF-κB. Recruitment of TBK1 to cytosol-invading Salmonella induces WIPI2-dependent antibacterial autophagy. A LC3-interacting motif in the influenza A virus M2 protein is required to subvert autophagy and maintain virion stability. Cell Host and Microbe 15: 239–247. Cellular self-defense: How cell-autonomous immunity protects against pathogens. 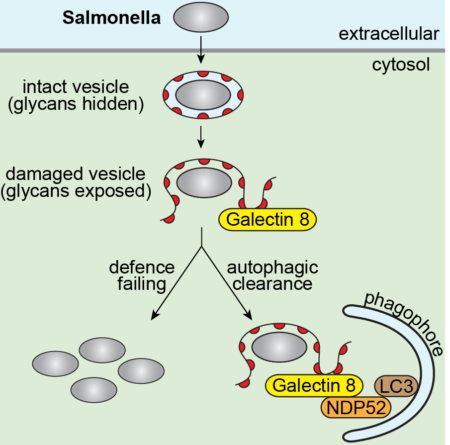 Galectin 8 targets damaged vesicles for autophagy to defend cells against bacterial invasion. Endoplasmic reticulum chaperone gp96 is essential for infection with vesicular stomatitis virus. Proc Natl Acad Sci U S A 107: 6970-6975.